The requirements for a database management system (DBMS) have included support for very large and complex data objects. DB2 UDB for OS/390 Version 6 introduced the support for large objects (LOBs): they can contain text documents, images, or movies, and can be stored directly in the DBMS with sizes up to 2 gigabytes per object and 65,536 TB for a single LOB column in a 4,096 partition table. The introduction of these new data types has implied some changes in the administration processes and programming techniques. The book Large Objects with DB2 for z/OS and OS/390, SG24-6571, introduced and described the usage of LOBs with DB2 for z/OS at Version 7 level. Major enhancements for LOB manipulation have been introduced with DB2 UDB for z/OS Version 8 and DB2 Version 9.1 for z/OS (DB2 9 in this book). These enhancements include performance functions such as the avoidance of LOB locks and DRDA LOB flow optimization, usability functions such as file reference variables, FETCH CONTINUE, and the automatic creation of objects. DB2 utilities provide integrated support with LOAD and UNLOAD, Cross Loader, REORG, CHECK DATA, and CHECK LOB. 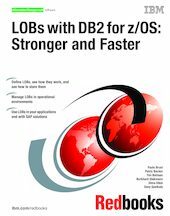 In this IBM Redbooks publication, we provide a totally revised description of the DB2 functions for LOB support as well as useful information about how to design and implement LOBs. We also offer examples of their use, programming considerations, and the enhanced processes used for their administration and maintenance. We also detail how SAP solutions use LOBs. This book replaces the previous book, Large Objects with DB2 for z/OS and OS/390, SG24-6571, for DB2 Version 8 and Version 9.1.